With its exceptional ease of use and addictive Snapshot Sequencer, Flow Motion is as fun as it is productive. Makes FM synthesis a snap. Snapshot Sequencer is amazing Intuitive, powerful modulation. Frequencies and envelope timings aren’t displayed in Hertz and milliseconds. Looking like the control panel for a nuclear reactor, Waves’ new plugin synthesiser takes an unorthodox approach to UI design. 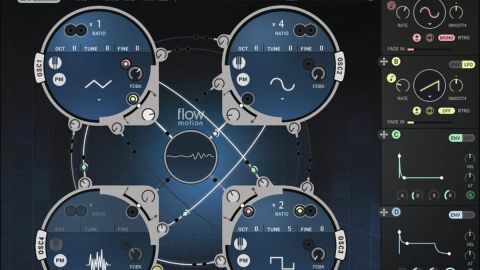 Despite its ‘science lab’ visuals, Flow Motion (VST/AU/ AAX/standalone) is actually remarkably friendly, serving up a novel take on FM synthesis that does away with the usual modulation matrix in favour of a more intuitive hardwired system. Flow Motion’s interface is divided into two pages - Flow and Motion - with a column of modulation sources ever-present on the right, and the innovative Snapshot Sequencer at the bottom (see Snap judgement). The synth is capable of up to 32 voices of polyphony and four unison voices, for a maximum total of 128 voices. It’s pretty resource-intensive, particularly when the Snapshot Sequencer is brought into play, and all those voices do, in the end, take their toll. The Flow page is home to the synth’s four oscillators. These can be deployed as regular analogue-style signal generators, their outputs mixed with their volume and pan knobs, or set to modulate each other’s phase or frequency in any and all possible combinations via the modulation path ‘cables’ joining every oscillator independently to each of its three siblings. This modulation is dialled in using the amount knobs at the start of each cable, and the cable itself becomes brighter as the modulation increases. It’s certainly one of the more straightforward FM/PM systems we’ve come across, and made more powerful by the two modulation insert points on each path, which we’ll come back to. Not content to break new ground with the groovy Flow page GUI, Flow Motion also innovates with the amazing Snapshot Sequencer. This lets you define up to 16 complete parameter states (sub-presets within the current preset, effectively) and switch between them rhythmically using a 16-step sequencer, and/or manually on the fly by assigning MIDI CCs to steps. The sequence length is set by dragging the end point handle in the sequencer, and each step is assigned a snapshot number by dragging up and down on it or tweaking a ‘learnt’ MIDI controller. Steps set to the ‘die’ snapshot number will select a random snapshot when played back. The Flow Motion GUI always reflects the snapshot in the currently selected step, and changes made to the parameters of a snapshot are automatically stored – you don’t have to actively save them. Snapshots can be copied and pasted between slots, but not imported from other presets or as discrete files, which is a hindrance. A controllable snapshot randomise function, for instant inspiration, would have been an idea. The sequencer itself runs at step rates from 4 Bars to 1/32, and can be triggered by note input, the host sequencer transport, or set to run free regardless of host playback status. The four oscillators are identical in their architecture, offering a choice of sine, triangle, saw, square and noise waveforms. Tuning controls comprise Octave, Tune and Fine knobs, for up to five octaves and 100 cents of adjustment up or down, and a Ratio parameter for multiplying the oscillator pitch by anything from 1/4 to 36. This last is primarily intended for achieving super-fast modulation rates in order to elicit clangourous tones and FX from a target oscillator, but proves handy with regard to audible output, too. The PM/FM button switches modulation of the oscillator between frequency and phase, while the key tracking button above locks it to a fixed frequency when deactivated (important for percussion sounds), and the Feedback knob modulates the oscillator by itself as it’s raised. At the very top of the Flow page, the Arpeggiator offers four octaves of range and four modes (Up, Down, Up/Down and Random), while the Note Sequencer runs up to 16 steps with 1-24 semitones of offset per step. Both include Swing and Gate controls. With the oscillators set up in the Flow page, processing their collective output is done in the Motion page. At the top is the multimode resonant filter, featuring low-pass, high-pass, band-pass and notch modes, 12 and 24dB/ octave roll-off slopes, and a dedicated ADSR envelope. There’s also an amp envelope with variable Gain, and a four-band paragraphic EQ with high and low cut filters. The FX section manages to squeeze eight effects into a very small space, by only providing controls for the stereo Delay and Reverb modules, and boiling the other six (Drive, Distortion, Crusher, Phaser, Flanger, Chorus) down to just an amount knob each. That might appear hopelessly restrictive on paper, but in fact, it fits nicely into Flow Motion’s ethos of immediacy and rapid workflow – and all eight modules sound fantastic. The four modulation sources on the right can be used to move numerous controls in the Flow and Motion pages (oscillator Volume, Pan, Ratio and Feedback; filter Cutoff, global Tune, FX depths, etc), as well as the FM/PM paths between oscillators. Sources are assigned by dragging them onto the black ‘insert’ sockets or right-clicking, and every modulation path can accept up to two inputs at a time. Each of the four sources can operate as a loopable ADSR envelope with adjustable velocity response, or a host-syncable LFO with fade-in, smoothing, variable polarity, one-shot or looped play, and monophonic or polyphonic retriggering. The lack of any kind of modulation sequencer is disappointing, but the envelope and LFO are both perfectly capable - the envelope loop option is a highlight, effectively enabling the creation of custom LFO shapes. Flow Motion is unique, slick, innovative and wonderfully easy to use. There’s real method to the graphical madness of the Flow page, which keeps everything clearly in view at all times; and the modulation path inserts are a very clever touch. One annoyance with this and other Waves plugins, however, is that LFO and filter frequencies, and envelope timings, are all described as values from 1-100. Annoying. Sonically, it’s beefy at the bottom and bright at the top, if not always hugely characterful; and, like any FM synth, it can come across as harsh if not handled with care. It’s great at basses, keys, bells, percussion, plucks and pads, but it’s the Snapshot Sequencer that really sets it apart, enabling insanely animated progressions and textures that couldn’t be made any other way. A fast, reliable synth that does everything it can to keep things moving, Flow Motion is a solid investment for any electronic producer.